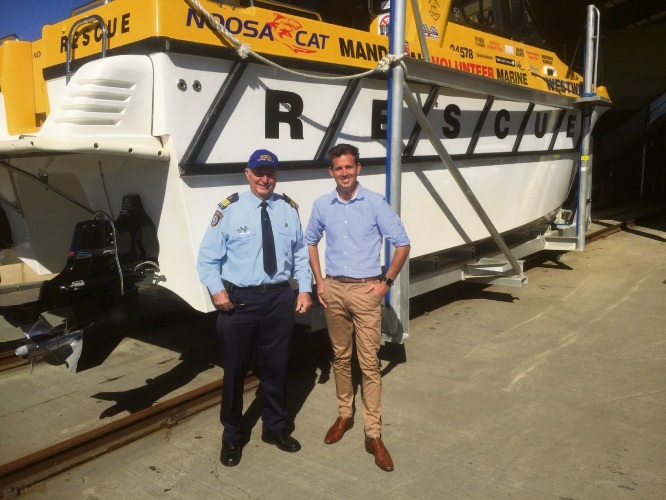 Mandurah Mayor Rhys Williams and Mandurah Volunteer Marine Rescue Commander John Blay in front of one of the group’s rescue boats. MANDURAH Volunteer Marine Rescue Group was recognised for its work by Mayor Rhys Williams when he visited its vessel station on March 29. The Mandurah Volunteer Marine Rescue Group works with WA Police to co-ordinate and perform search and rescue missions at sea, and throughout the Peel Region waterways. During the visit, the Mr Williams was shown the facility and the vessels used to carry out some of the rescues performed. Mr Williams said members of the Mandurah Volunteer Marine Rescue Group played a significant role in ensuring the Mandurah and Peel marine environment was safe. “Local emergency service volunteers, like the Mandurah Volunteer Marine Rescue Group, donate their time to protect our community and it’s so important to recognise the critical role they play,” he said. “These volunteers represent what the Mandurah spirit is about – helping others, reaching out, and giving up valuable time for the community. The volunteer-run group goes about its important work in times of need, and also at various community events and activities. In 2017, the group attended 159 police authorised incidents including distress calls, search and rescue incidents and recoveries. It also assisted with 11 events including Mandurah Crab Fest, New Year’s Eve celebrations and the King of the Cut Paddle Board Race. To become a member call 9535 4789.